The only thing that might prevent more Palestinians being gunned down in the coming weeks is the force of international public opinion, argues PSC's Ben Jamal ahead of a national solidarity demonstration in London tomorrow. On March 30th, thousands of Palestinians congregated near the Israeli controlled border in Gaza, launching a series of protests planned to last until at least May 15th under the banner of the ‘Great Return March’. By the end of the day, 15 Palestinians lay dead, shot by Israeli snipers positioned on the other side of the heavily militarised border fence and sheltered behind mud embankments; a toll that has subsequently risen to 18. Approximately 1,500 Palestinian protesters were injured, more than 750 of them by live ammunition. Pictures that have emerged online of these injuries show horrendous exit wounds from which survivors will take years to recover. Not a single Israeli casualty was reported. Videos of the shootings clearly show protesters were being shot at whilst running away from the border. One video shows a boy shot to death while praying. Most devastating, perhaps, are the images of young men and women walking calmly towards the border, waving the Palestinian flag before being felled by sniper fire. These protesters were propelled by the shared history of injustice of which Darwish spoke, and a belief that to protest, at whatever cost to the self, is not only a right but an obligation. The date chosen for the protest, Land Day, marks the anniversary of another massacre carried out by Israeli forces in 1976, when Palestinian citizens of Israel were fired upon while protesting the Government’s decision to seize over 2000 dunums of Palestinian land for Jewish settlements; killing 6 and wounding 100. The Gaza demonstrations are primarily motivated by two things. First, a reassertion of the right, recognised in international law, for Palestinians to return to the homes from which they were forcibly expelled in 1948 and again in 1967. It is worth remembering that 70% of the population of Gaza are UN-recognised refugees. The second motivation is the ongoing siege of Gaza, now in its 11th year, which according to a UN report will render the tiny coastal enclave uninhabitable by 2020 unless the siege is lifted. 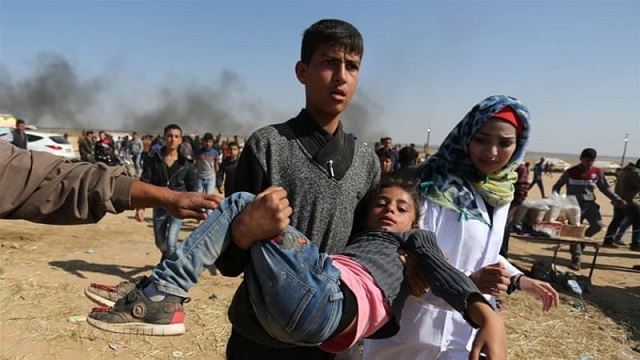 As Medical Aid for Palestinians reported on Monday: “This influx of casualties has occurred in the context of a health system that was already on the verge of collapse after a decade of illegal closure and de-development”. In February, the World Health Organisation reported that 42% of essential medicines were completely out-of-stock in Gaza. Those who were killed on Friday are, in death, denied the right of a universal acknowledgement of their humanity. Israeli Prime Minister Benjamin Netanyahu has praised the soldiers responsible for the killing of what he has described as ‘terrorists’. The majority of the UK media has also been complicit in denying the value of the lives lost. Where fatalities were reported, these victims of a massacre were described as casualties in ‘clashes’ between themselves and Israeli forces. 18 Palestinians killed, approximately 1,500 injured, and no Israeli casualties. By what definition can this be described as a ‘clash’? The Great Return March will continue for six more weeks, until May 15th, the 70th anniversary of the 1948 “ Nakba”. The Israeli government, shielded from international censure by its western allies, has announced that it will continue to meet peaceful demonstrations with live fire. The only thing that might prevent more Palestinians being gunned down in the coming weeks is the force of international public opinion. The Israeli government is effectively acting on the presumption that people across the world do not think Palestinian lives matter. On Saturday 7th April, a national demonstration in London, called by Palestine Solidarity Campaign and its partners, is an opportunity to send a clear message: Palestinian lives do matter. PSC has also called on all citizens of the UK to demand action from the government. At a minimum, the UK government should support the UN call for a full, independent and transparent investigation. Concerted international action to lift the siege is also long overdue. Moreover, as one of the main arms exporters to Israel and a major purchaser of Israeli weapons and weapon technology, the UK must re-examine its bilateral trade agreement with Israel. If the UK government properly enforced its own export guidelines, the result would be a de-facto embargo on arms exports to Israel. We are not calling for exceptional treatment of Israel. To the contrary, we are calling for an end to the exceptional treatment of Israel, which has, for too many decades, allowed for ethnic cleansing, military occupation and the imposition of apartheid practices against Palestinians. The cost of our continued inaction is being paid for with Palestinian lives. Write to Boris Johnson and urge the Government to take action now, and join us tomorrow, Saturday 7th April, to call for an end to the siege of Gaza and ask UK government to condemn Israel’s actions. When: Saturday 7 April, from 1pm – 3pm. Where: Opposite Downing Street, SW1A 2AA.